Biogeographic divergences in the Iberian flora. A morpho-anatomic,ISSR-based, and environmental study of Iberian Buxus sempervirens L.
Iberian Buxus spp. Are represented by B. Sempervirens, restricted to the Cantabrian, eastern Iberian Peninsula, and northeastern mountain systems, emerging scarcely in Portugal, and by B. Balearica that occurs in the Betic deep river valleys and in the Balearic islands. The genetic affinity existent between fifteen populations of B. Sempervirens was evaluated by seven ISSRs primers. Moreover, leaf morpho-anatomical measurements indicative of leaf performance (such as leaf area, leaf mass per unit area, width, length, shape factor, tissues thickness, stomatal density, and quantification of epi- and intracuticular waxes) and environmental characterization were conducted to get insight into the functional ecology of the genus Buxus. Six populations of B. Balearica and 15 of B. Sempervirens, collected in the Iberian Peninsula and the Balearic islands, were included to establish the interspecific ranges. A functional ecological description by morpho-anatomical analysis of leaves and a genetic and environmental approach exposed differences between Pyrenaean-Cantabrian-Portuguese and Iberian B. Sempervirens populations. Genetic relationships among Buxus populations were investigated using inter-simple sequence repeat (ISSR) markers. Seven ISSR primers generated a total of 159 unambiguous and repeatable bands, of which 156 (98.1%) were polymorphic. These divergences for Iberian B. Sempervirens are explained by the isolation in their distributions since the Oligocene. Previsions for future climate change scenarios confirm those biogeographic divergences for the Iberian B. Sempervirens. ISNAD CARVALHO, MÁRCIA , ROCHA, JOÃO , CARNIDE, VALDEMAR , MARTINS, SANDRA , MUS, MAURICI , AMICH, FRANCISCO , ALMEIDA, RUBIM , MACHADO, CLAÚDIA , GONÇALVES, BERTA , BACELAR, EUNICE , CRESPI, ANTONIO . "Biogeographic divergences in the Iberian flora. A morpho-anatomic,ISSR-based, and environmental study of Iberian Buxus sempervirens L.". 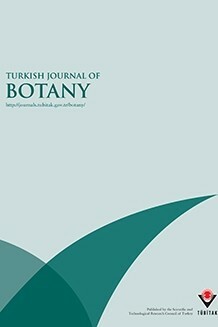 Turkish Journal of Botany 40 / 1 (February 2016): 1-16.